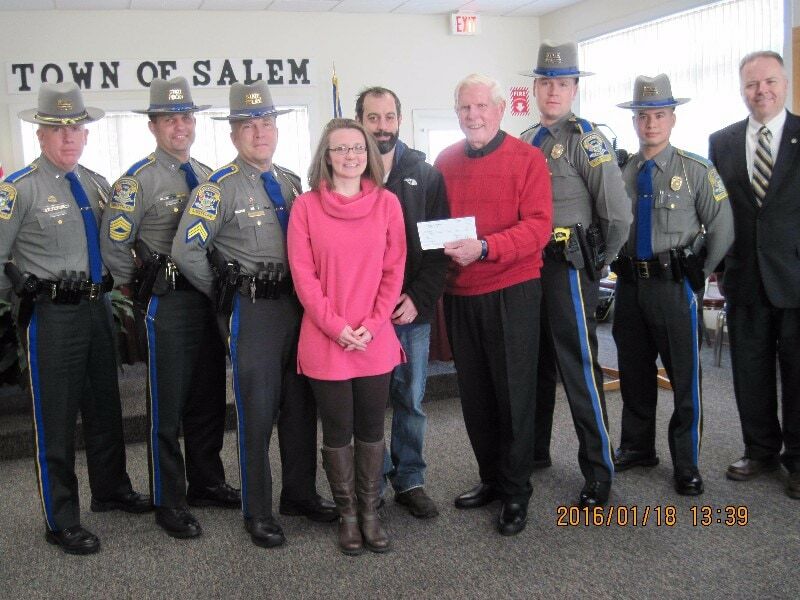 On January 18, 2016, Cops For Kids With Cancer went to the Salem, Conn. Town Hall and made a $5,000 donation to the family of Brynn Levitsky, a 4 year old girl from Salem, Conn. Who has Leukemia. Unfortunately Brynn was unable to attend. She was sponsored by the Conn. State Police. In photo left to right. Liuet. Eric Murray, Sgt. James Gillman, Sgt. Jake Fontanella, Mother Kara, Father Brian, Bob Faherty, Trp. Chris Pariseau, Trp. Luke Larue, and First Selectman, Kevin Lydon.